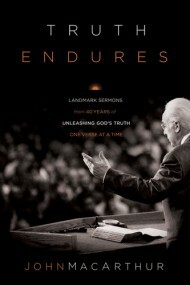 This past Sunday, June 5th, 2011, John MacArthur accomplished something that is extremely rare in Christendom. He finished preaching through the entire New Testament, verse by verse. To our knowledge here at Grace, this hasn’t been done in over a hundred years or more. The one person that comes immediately to my mind is John Gill, who preached through both the OT and NT, but that was in the 1700s. It was an emotional moment. John’s last sermon was on the longer ending of Mark, chapter 16:9-20. It was a encouraging message that explained the confidence we can have in the integrity of the Scriptures. You can listen to all 42 years worth of his expositional preaching online for free. This is a gift to the Church, both in its original delivery and its modern availability.